controlling and manipulative nature, and a great desire for power. Check out an image of his hand here. All this is evident from the shape of his hand, fingers and thumb, and also whatever little can be seen of his headline from the pictures. He may not be an intellectual, but he is savvy, shrewd and articulate. Materialism and a love for the good life is shown, but hopefully he will keep this side of him in balance. The mount development on Akhilesh’s hand shows him to possess a good balance of the right qualities. Although overall all of the mounts appear to be well developed, his Jupiter and Venus mounts are more prominent, along-with that of the Mercury mount, and to a lesser extent that of Moon. The Mars mounts are developed in moderation, more so the Plain of Mars. All these signs mean that Akhilesh is at heart a good human being, with a basic love for people. Mental strength is present as well as sufficient levels of aggression, and he will be able to make tough decisions. Akhilesh's hand shows that at the start of his life he led a protected life. His Headline becomes stable only as he nears 40. Without seeing his hand properly I cannot say what caused this disturbance on the Headline and how it affected his personality, but it could affect decision making. What is clear from his hand is that his hand shows long-term success. However, it is not possible to say whether he will be successful in politics or business. His hand shows business ability and a desire for wealth and fame. Readings of other chief ministers of Indian states: Mamata Banerjee's hands tell us about her character or Mayawati's hands reveal her personality characteristics or Do Narendra Modi's hands show his complicity in the Gujarat riots of 2002? Interesting...the guy has potential, at least much more than Rahul Gandhi. He's also displayed a certain maturity - thus far! I don't know too much about him, but he appears to be a sensible sort. Lets see how he manages the future. If he plays his cards right, he can go places. And as for Rahul Gandhi, Rahul can never be a leader even if he is thrust into the seat like his mom is trying to do. Oh yes, akhilesh yadav is in a entirely different league! Let's hope more youngsters like him rise up to the top. India needs some young blood at the management ranks. Is it possible that he becomes like his father after 20-30 years? DI, that is a terrifying thought, him becoming like his father! I certainly hope not! 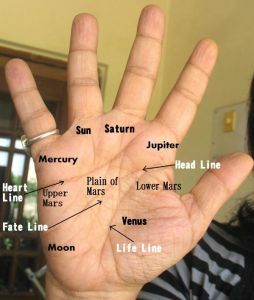 Smita, I need several hand photos before I can read a hand. Perhaps in the future I might be able to get some.